A Strain gauge (sometimes refered to as a Strain gage) is a sensor whose resistance varies with applied force; It converts force, pressure, tension, weight, etc., into a change in electrical resistance which can then be measured. When external forces are applied to a stationary object, stress and strain are the result. Stress is defined as the object's internal resisting forces, and strain is defined as the displacement and deformation that occur. The strain gauge is one of the most important sensor of the electrical measurement technique applied to the measurement of mechanical quantities. As their name indicates, they are used for the measurement of strain. As a technical term "strain" consists of tensile and compressive strain, distinguished by a positive or negative sign. Thus, strain gauges can be used to pick up expansion as well as contraction. The strain of a body is always caused by an external influence or an internal effect. Strain might be caused by forces, pressures, moments, heat, structural changes of the material and the like. If certain conditions are fulfilled, the amount or the value of the influencing quantity can be derived from the measured strain value. In experimental stress analysis this feature is widely used. Experimental stress analysis uses the strain values measured on the surface of a specimen, or structural part, to state the stress in the material and also to predict its safety and endurance. Special transducers can be designed for the measurement of forces or other derived quantities, e.g., moments, pressures, accelerations, displacements, vibrations and others. The transducer generally contains a pressure sensitive diaphragm with strain gauges bonded to it. Learn more about strain units and the history of the gauge sensors. General purpose precision strain gauges are encapsulated constantan foil strain gauges offered in a wide variety of patterns for scientific, industrial and experimental stress analysis. These precision strain gauges can be used for experimental stress analysis monitoring industrial equipment or various scientific applications. In the General purpose strain gauge section you will find the strain gauge patterns next to the part numbers so that you will be able to see the geometry of the strain gauge. The gauge dimensions are also provided in and SI (Metric, mm) and US Customary (English, inches) units. 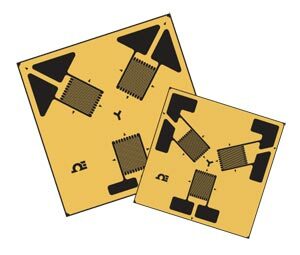 General purpose precision strain gauges are offered in linear patterns, dual parallel- grid patterns, Tee rosettes (0/90°), rectangular or delta (45° or 60°), stacked or planar rosettes, and shear patterns. Transducer-quality strain gauges are for customers who are manufacturing transducers or similar sensing devices. Transducer-quality strain gauges feature a tighter tolerance on the carrier trim dimensions which allows the carrier edge to be used for strain gauge alignment if required. They also feature tighter tolerances on nominal resistance values. These gauges can be creep adjusted to meet a transducer manufacturer’s specifications and they can be customized to the unique requirements of a transducer. They are also excellent gauges off-the- shelf for experimental stress analysis and/or strain verification projects. Omega offers a full line of Karma Strain Gauges. Karma Strain gauges can be used for various static and dynamic applications. Karma strain gauges are used for transducer applications where long term stability or higher temperature use is required. When used at room temperature, for static strain measurements, the transducer will have very good stability for months or even for years. Karma strain gauges are also suggested for static strain measurement over a wide temperature range from -75 to 200°C (-100 to 392°F) due to its good linearity over this wide temperature range. Karma strain gauges are often used for fatigue-rated transducer designs. T e fatigue life of Karma alloy tends to be much better than constantan, and so transducers using Karma strain gauges provide good fatigue life. Karma is a nickel-chromium alloy, and was selected as a strain gauge material for it’s modulus-compensating capabilities which tends to significantly reduce span shift in transducer design. With Karma alloys, the gauge factor tends to decrease with increasing temperature. This effect of decreasing elastic modulus will tend to reduce the span shift. Karma alloys do have drawbacks, for example they are difficult to solder without special fluxes. OMEGA has the solution. We have eliminated this problem by offering our Karma Strain Gauges with copper plated solder pads. No special flux or procedures are needed. The first bonded, metallic wire-type strain gauge was developed in 1938. The metallic foil-type strain gauge consists of a grid of wire filament (a resistor) of approximately 0.001 in. (0.025 mm) thickness, bonded directly to the strained surface by a thin layer of epoxy resin. When a load is applied to the surface, the resulting change in surface length is communicated to the resistor and the corresponding strain is measured in terms of the electrical resistance of the foil wire, which varies linearly with strain. The foil diaphragm and the adhesive bonding agent must work together in transmitting the strain, while the adhesive must also serve as an electrical insulator between the foil grid and the surface. When selecting a strain gauge, one must consider not only the strain characteristics of the sensor, but also its stability and temperature sensitivity. Unfortunately, the most desirable strain gauge materials are also sensitive to temperature variations and tend to change resistance as they age. For applications of short duration, this may not be a serious concern, but for continuous industrial measurement, one must include temperature and drift compensation. Half bridge Strain Gauges for Shear or Torque Applications. Their rugged construction, reliability and flexibility make them suitable for highly accurate static and dynamic transducers. In order to measure strain with a bonded resistance strain gauge, it must be connected to an electric circuit that is capable of measuring the minute changes in resistance corresponding to strain. Strain gauge transducers usually employ four strain gauge elements that are electrically connected to form a Wheatstone bridge circuit. The Figure 1 shows a typical strain gauge diagram. A Wheatstone bridge is a divided bridge circuit used for the measurement of static or dynamic electrical resistance. The output voltage of the Wheatstone bridge is expressed in millivolts output per volt input. The Wheatstone circuit is also well suited for temperature compensation. The number of active strain gauges that should be connected to the bridge depends on the application. For example, it may be useful to connect gauges that are on opposite sides of a beam, one in compression and the other in tension. In this arrangement, one can effectively double the bridge output for the same strain. In installations where all of the arms are connected to strain gauges, temperature compensation is automatic as resistance change (due to temperature variations) will be the same for all arms of the bridge. We can provide custom creep specifications to match your spring element to maximize the performance of your sensor. Our team will work with you to modify creep compenstaion higher or lower as required by your test results. OMEGA can provide 1/2 or full Wheatstone bridge designs or custom Rosettes. We strive to make buying a custom strain gauge fast and easy. Just send OMEGA your custom drawing along with your specifications and the quantity of strain gauges required. The OMEGA team will work with you on your application and provide a quotation for the custom strain gauges. We can make proof samples of the custom gauges in as little as 2-weeks. With production quantities shortly thereafter. A custom part number will be created for your strain gauge to make future ordering fast and easy.